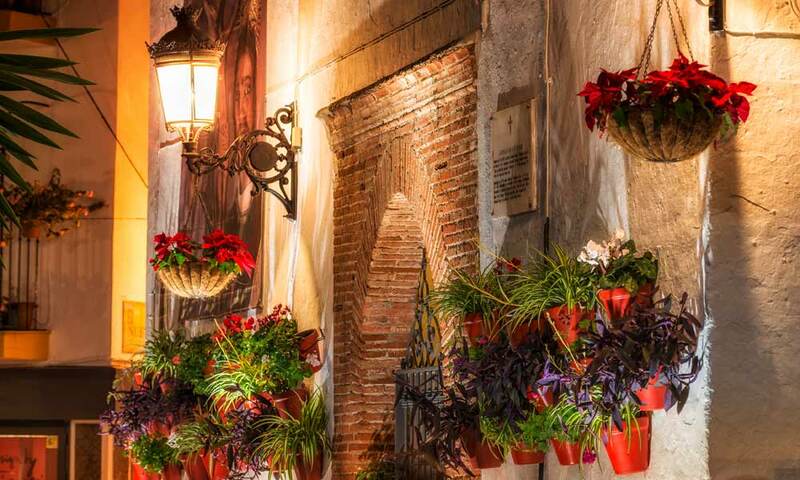 Marbella old town is filled with Andalusian character on all sides. Its quaint, narrow streets are flanked by white buildings with balconies adorned with flowers, shops with personality and square with a special air. 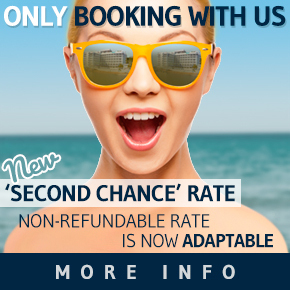 Marbella is one of Spain’s most important points of reference for tourism, a destination desired by thousands of Spanish and international travellers. The magnificent preservation of its historic and cultural legacy is witness to a past that is seen in tradition, in the secrets that live in its alleys and in an architecture that survives centuries later. 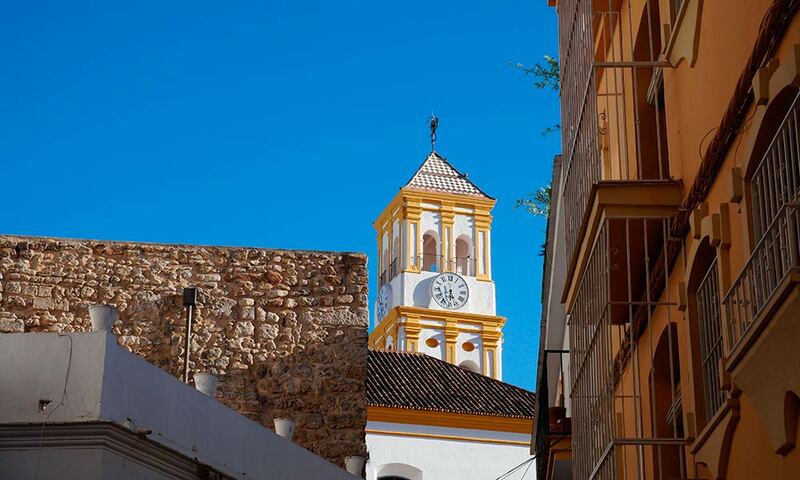 Marbella preserves the traces of a historical process that is both interesting and extensive in time. Its beginnings date back to the Roman period, though it can be said that the historic centre is the result of a Muslim settlement, where architectural remains, archaeological vestiges and testimonies by chronicles and travellers from the 12th century onwards converge, since it is from this century that Marbella began its development to the north with calle Ancha. 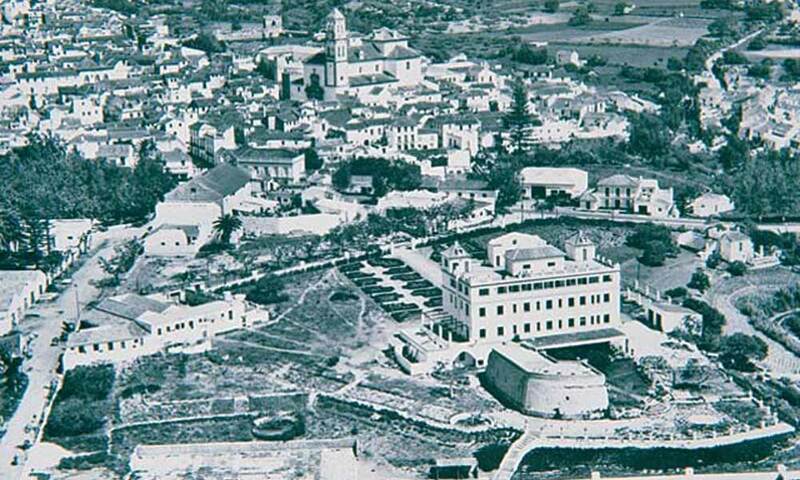 One century later it spread to the east with Barrio Nuevo, around what is now calle Málaga, where Cruz del Humilladero is located. This square is indisputably the heart of Marbella old town. Here you can enjoy some of the city’s most beautiful monuments. While the old town is full of squares and beautiful corners, this square has something captivating, albeit hard to explain. The Alcazaba is one of the historical elements that can still be enjoyed in Marbella. This construction shows different architectural elements that include Roman traces. As all fortifications, it was used as a defensive means until the Christian Reconquest, when it became an important coastal watch point. Some of the towers that are preserved in the fortress walls were given names like Torre del Homenaje, Torre Blanca, Torre de la Campana, Torre de la Puerta de Hierro, etc. The Arab Castle is located a short distance from Plaza de los Naranjos and from the Church of the Incarnation. It is a Muslim construction that was erected by Abderraman III, and of what is currently visible, two towers and the College of Our Lady of Carmen today stand where the arms yard was. It has also been a Site of Cultural Interest since 1949. The Magistrate’s House is the most treasured monument in Marbella’s old town. Its architectural style is late Mudejar gothic. As its name suggests, the building was the residence of the Magistrate. Today, its ground floor has a restaurant specialising in Mediterranean cuisine. This square is a must-see in Marbella. Its particular attraction are its colours and ambience. In earlier times, it was one of the three existing approach roads the city had. 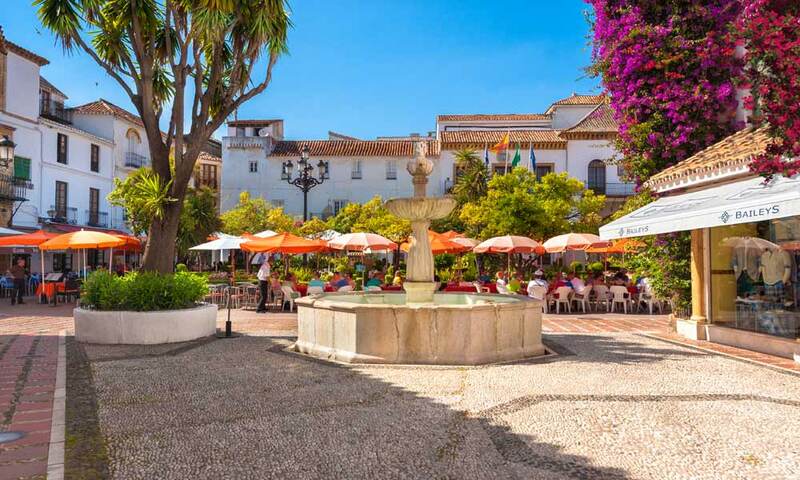 Plaza de la Iglesia is one of the most beautiful squares in Marbella’s town centre and a must-see for visitors. It also often hosts events such as markets and concerts. The added value of this area is the Church of Our Lady of the Incarnation on one side of the square and the ruins of the walls of the old castle on the other. These two squares are the most practical entry points for visiting Marbella’s centre. Plaza de la Victoria has special charm, full of leafy trees and is also the best place to get tapas. Conversely, Plaza África is a must-see for visitors walking from Alameda or Avenida del Mar. Vigil de Quiñones Park is a forest park that combines exuberant vegetation with amenities for children and adults. Right at the entrance, tourists will find a petanque court, a multi-use track and a football pitch, in addition to a recreational area and cafe. At just over a mile long and with a surface area of almost 59,000 square feet, Arroyo de la Represa Park is the ideal place to spend a fun day, since it has two artificial lakes, sports tracks and a kid’s play area. It is also home to the Bonsai Museum, one of the places you must visit when in Marbella. This park is perfect for relaxing and strolling… a place where you can disconnect in the very heart of Marbella. Parque de la Constitución is characterised by enjoying abundant vegetation and having a very pretty, albeit small, astronomical observatory. It also has an auditorium that often hosts shows. Marbella’s historic centre is home to spectacular places for having a beer or a glass of delicious wine while enjoying the best snacks that Mediterranean dining has to offer. A good example of this is calle San Lázaro, a small alleyway between Plaza de la Victoria and calle Fortaleza. Here you will find four of the most authentic bars: Tierraranda, Bar Bartolo, La Niña del Pisto and Bar El Estrecho. We recommend you also visit the Taberna El Bordón and the Taberna Casa Curro, which are located a short distance away and where you can enjoy top quality food, charm and good prices. Also visit Sidreria Paca, a small place, but with lots of ambience. Then, if you head down calle Ancha, you should make an obligatory stop at Bodega El Torero. Looking for somewhere to eat in Marbella old town is a pleasure because there is a wide range of restaurants. You will find places to eat on any alleyway, though there are three ideal zones to use as a reference: Plaza de Los Naranjos, Calle Ancha and Calle Tetuán, and Calle Virgen de los Dolores and Ortiz de Molinillo. At Témpora you will enjoy a romantic, charming ambience. We recommend it if you want to enjoy a great dinner in the most pleasant of settings. Skina is a restaurant with 1 Michelin star that offers Mediterranean and traditional cuisine. It has to be said that, while the restaurant is small, its decor and the waiters’ manner will make you feel at home. 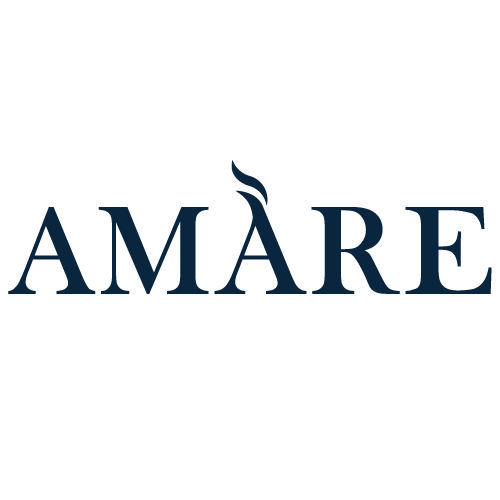 Zozoi de Marbella offers international dishes with a menu primarily focusing on tourists, so you can enjoy a variety of cuisines from Italian to Thai and Asian. At this restaurant, much care has been taken with both the decor and the service, which is why the establishment is particularly cosy. This restaurant is proud to offer slow food, a concept of cuisine based on fresh, organic produce. It is located in one of the oldest houses in Marbella that dates back to 1502. Marbella’s old town is perfect for those seeking bars with a relaxed, pleasant atmosphere. This place is ideal for starting the night, since many decide to start here and then move onto the Marina until the early hours. Malasuerte Bar de Copas is a very popular place frequented by both locals and visitors. It is a very lively rockers pub, where good music and fun are never in short supply. This is a classic bar for enjoying Marbella at night. It is very popular for its caipirinhas and mojitos, and also stands out for having live music. 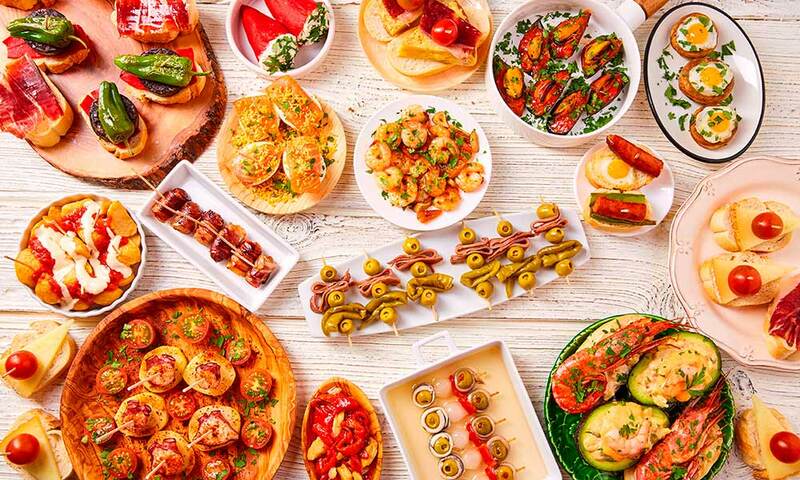 At weekends, it also offers a wide range of tapas with two for the price of one. A curious bar with an English ambience where you can have a fun time. In addition to enjoying a mojito or a glass of wine, it has dozens of accessories for its customers to dress up with: pirate hats, masks and other objects with which you can take photographs and have a laugh. This small bar, situated in a quiet part of the historic centre, has a terrace and a young clientele that seeks a complete offering at very competitive prices. 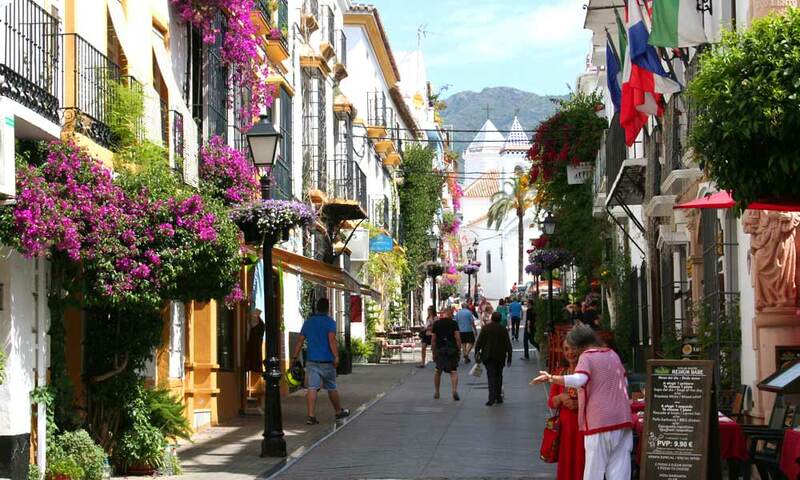 In Marbella’s town centre, you can enjoy exploring the unusual, small family shops; a mix of traditional and new shops, whose hand-made jewellery and clothing you will love. Each corner has a surprise. There are specialist shops offering souvenirs, olive oil, local pottery and lace, all mixed with historic architecture. A delight for the senses. A beautiful shop specialising in Spanish olive oils and other products such as vinegars, salts and spices. It also has a line of organic cosmetic products made with extra virgin olive oil. If you are a lover of Bacchus’ liquor, this specialist premises offering a wide range of wines makes an ideal stop to get some recommendations and a gift to take home. With a strong commitment to wines from Málaga, Andalusia and Spain, and a gourmet food section. A shop with countless vintage treasures that will take you back to the most iconic times of the 20th century. At Vintage Déjà Vu, which has been around for over two decades, you can choose from a variety of fashion items such as bags, dresses, accessories and shoes. Legend has it that in a chamber of the Barbican of Marbella Castle, there was a treasure enclosed in clay vessels, whose whereabouts were known only by Mustapha, the “charmed Moor.” Whoever was brave enough to try to get it would have to go three nights in a row to the place where a huge bull would be waiting, a large snake and finally on the third night, they would receive the precious treasure from the hands of Mustapha. The Chapel of San Juan de Dios, popularly known as “El Hospitalillo” and built in the 16th century by order of the Catholic Monarchs, hid Mozarable panelling for centuries, which only came to light in the mid-20th century. A cross located on Calle Málaga shows the exact spot where, according to tradition, the Muslim governor of Marbella, Aguneza, handed over the keys to Ferdinand the Catholic on the day of the city’s reconquest on 11th June 1485. Each year on this date, which is a festival in Marbella, the day of its patron saint, San Bernabé, is celebrated. So do you know of any other? 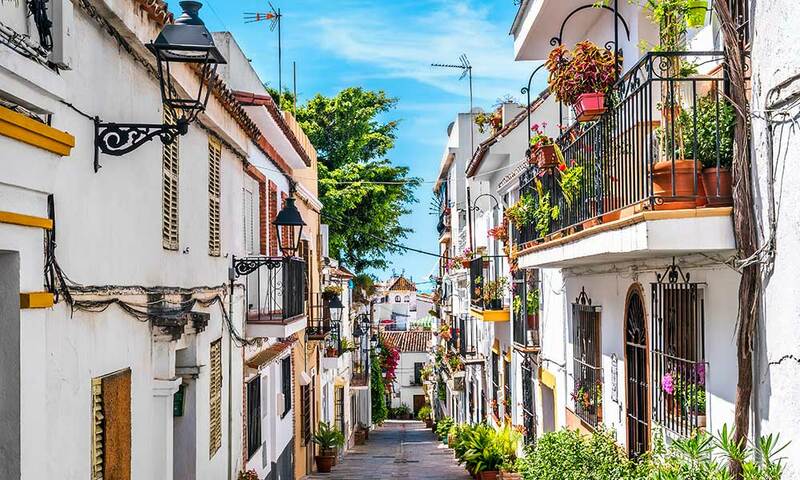 If you really want to enjoy Marbella’s historic center, we recommend you throw your map into the first bin you find and stop for a second, since the best way to enjoy this marvellous enclave is to just wonder around its streets without worrying about where you are going or how long it will take you. 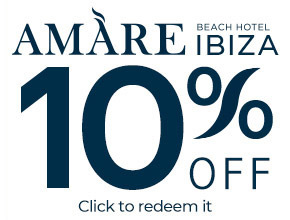 Walk and take in its relaxed atmosphere. 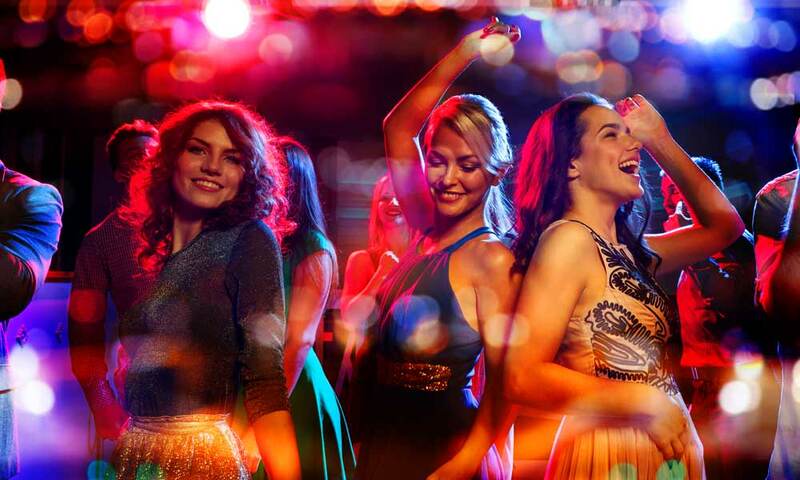 In summary, deciding what to do and see in Marbella’s old town beforehand can help you and give you a general idea of what you will find, but the best advice we can give you is to just come.